Background: Global ventricular function often remains normal in patients with beta-thalassemia major. (β-TM) until late. Tissue Doppler and strain imaging may be useful to assess regional myocardial function abnormalities in these patients. Methods: Systolic (Sm), early diastolic (Em), and late diastolic (Am) (Em/Am) myocardial velocities at basal lateral and septal left ventricular (LV) segments, strain (S), and strain rate (SR) in basal and mid LV, right ventricular (RV) and septum were measured in 30 patients (β-TM, 12.4 ± 5.2 years, serum ferritin 2603.1 μg/L) and twenty controls (12.5 ± 5.2 years). Flow-mediated dilatation (FMD) vasodilatation as a measure of endothelial function was also assessed. Results: Patients had significantly higher LV mass index (169.45 ± 61.14 vs. 104.66 ± 24.42; P = 0.009) while global LV Sm and diastolic function was similar to controls. Patients had significantly lower lateral Em velocity, Em (10.12 ± 1.16 vs. 17.9 ± 2.11; P = 0.002), Em/Am ratio (0.811 ± 0.192 vs. 2.06 ± 0.62; P = 0.001) at the basal lateral LV, lower strain values at the basal lateral LV (19.5 ± 4.17 vs. 24.196 ± 1.81; P = 0.002), mid lateral LV (19.07 ± 3.98 vs. 25.56 ± 2.62; P = 0.042), basal septum (17.04 ± 3.44 vs. 25.43 ± 2.53; P = 0.001), and mid septum (20.49 ± 5.34 vs. 24.45 ± 2.20; P = 0.001) as compared to controls. SR at the basal and mid segment of the lateral LV wall and at the basal and mid septum was also significantly lower in patients. SR in basal and mid RV although lower was not significantly different from controls. Patients also had significantly lower FMD (7.57 ± 3.16 vs. 18.08 ± 1.9, P = 0.018) implying endothelial dysfunction. Conclusions: Tissue Doppler, strain and SR imaging are useful to quantify regional myocardial function in asymptomatic α-TM patients with preserved global Sm and diastolic function. Cardiac involvement is common in beta-thalassemia major (β-TM) due to tissue iron overload and myocardial parenchymal damage with progressive systolic (Sm) and diastolic dysfunction of the left ventricular and/or right ventricular (LV/RV)., Although cardiac failure due to iron overload is the most frequent cause of death in patients with β-TM, cardiac involvement is often multifactorial secondary to iron deposition, myocarditis, immunogenic mechanisms, and endothelial dysfunction.,, Conventional echocardiographic (ECG) parameters are often inadequate to detect subtle abnormalities of cardiac dysfunction in patients with β-TM since global ventricular function remains normal until late stages of the disease. Tissue velocity imaging (TVI), ventricular strain imaging (SI), and strain rate imaging (SRI) are superior to routine ECG techniques for analysis of regional and longitudinal myocardial function.,, Previous studies of tissue Doppler and SI in patients with β-TM have yielded wide-ranging results.,,,, The aims of the present prospective study were to assess conventional, TVI, SI, and SRI ECG parameters in patients with β-TM and compare them with matched controls. In addition, assessment of endothelial function was done by measuring vascular endothelial-dependent (flow mediated dilatation [FMD]) and endothelial-independent (nitrate mediated dilatation [NMD]) function of the brachial artery. Patients with β-TM, under routine follow-up of the Genetics Department of our institute, were included in the study following the method of the consecutive sampling. Patients with β-TM were included in the study after obtaining informed consent, and the study conformed to the institutional ethical guidelines. Age- and gender-matched healthy subjects were recruited as the control group. The diagnosis of thalassemia was based on hemogram, blood smear, hemoglobin electrophoresis, and clinical evaluation. Patients with congenital or rheumatic valvular heart disease, present or past history of heart failure, arrhythmias or those on cardiac medications (including β-blocker, calcium channel blocker, angiotensin-converting enzyme inhibitor, or diuretics) were excluded from this study. All cases underwent a detailed clinical examination to exclude any overt sign of heart failure and routine laboratory investigations, namely, hemoglobin, fasting glucose, total cholesterol, and serum ferritin levels were estimated in all. The mean serum ferritin level was derived by averaging the previous 6–8 values obtained over the past 1 year every 2 monthly while in controls additional blood samples were drawn for same. Diastolic Doppler parameters were recorded including early and late transmitral diastolic velocities (Evel and Avel) and their ratio (E/A) and early deceleration time (EDT) of the transmitral diastolic flow. Tei index or myocardial performance index (MPI), an ECG Doppler load independent index of combined Sm and diastolic function, was calculated as isovolumic relaxation time plus isovolumic contraction time divided by ejection time. Measurements were performed over three heartbeats, and an average of the three measurements was taken. TVI analysis of the mitral annulus was performed in the apical four-chamber window. A 5 mm sample volume was placed at the desired area of interest and Sm velocities at the basal segments of the lateral LV wall (LV-Sm), septal wall (septal-Sm), early and late diastolic myocardial (Am) velocities (Em, Am), and their ratio (Em/Am) of the same basal segments of lateral LV wall (i.e., LV-Em, LV-Am, and LV-Em/Am for the basal lateral LV segment) and septal wall (septal-Em, septal-Am and septal-Em/Am for the basal septal segment) were also recorded. The apical four-chamber view was used to record the cardiac cycle in tissue Doppler imaging mode at a frame rate of more than 100/s following which 2 mm volume samples were placed at four segments of the LV and two segments of the RV in apical four chamber view for strain analysis. Strain and SRI measures included longitudinal systolic strain and strain rate (SR) at the basal and mid segment of the lateral LV wall (S-LV-Basal, S-LV-Mid and SR-LV-Basal, SR-LV-Mid), basal and mid septum (S-septal-basal, S-septal-mid and SR-septal-basal, SR-septal-mid), and basal and mid-RV (S-RV-Basal, S-RV-Mid and SR-RV-Basal, SR-RV-Mid). The TVI, strain, and SRI measures were obtained from the offline analysis of the stored loops. Strain values were expressed as the negative percentage values, and the SR was expressed as negative 1/s values. All above measurements were made from three consecutive beats at end expiration, and results were averaged to get the final value. End-diastole was defined by the peak of the R, and the end systole was defined by the end of the T-wave on the ECG. The intraobserver variability for strain parameters was observed to be 3.1% ± 2.2% while the interobserver variability was 5.7% ± 3.1%. The arterial endothelial function of the brachial artery was assessed noninvasively by ultrasound examination of the vasodilation response to endothelium-dependent and -independent stimuli, as previously reported. The right brachial artery, proximal to the antecubital fossa, was imaged longitudinally using the linear-array transducer. Flow-mediated endothelium-dependent (FMD) vasodilatation was assessed by measuring the brachial artery diameter at baseline and during reactive hyperemia. Reactive hyperemia was induced by deflating a cuff previously inflated to 300 mm Hg for 4.5 min in the forearm. Arterial flow velocity was measured at baseline and during reactive hyperemia using pulsed-wave Doppler. After 10–15 min, the endothelium-independent response (NMD) was assessed by the change in artery diameter at 3–4 min after a 5 mg dose of sublingual glyceryl trinitrate. The parameters were measured for three consecutive cardiac cycles, and the average was taken. For the measurement of carotid intimal medial thickness (CIMT), the subject was made to lie supine with the neck turned contralaterally to the side being examined. The measurement was taken in the 1 cm segment of the common carotid artery (CCA) proximal to the carotid bulb which was defined as the point of the deviation of the far wall from the parallel plane of the distal CCA. The CIMT was measured by the caliper as the distance between the inner echogenic line representing the intima blood interface and the outer echogenic line representing the adventitia-media junction. Measurements were repeated three times unfreezing the image on each occasion and relocating the position of the maximal intima – media thickness. The mean value of the each set of the readings represented the mean CIMT that was taken for the final analysis. The intraobserver variability for CIMT was 5.8% ± 3.7% while the interobserver variability was 7.6% ± 4.2%. The data are expressed as the mean ± standard deviation statistical analysis was performed using the Statistical Package for Social Sciences, version 17, for Windows (SPSS, Chicago, Illinois, USA). The independent t-test and Chi-square test were used for comparison of the continuous and categorical variables between groups, respectively. To study correlations, Pearson's and Spearman's coefficients were used for continuous and categorical variables, respectively. P < 0.05 was considered statistically significant. The study included 30 β-TM patients (23 males, mean age 12.4 ± 5.2 years) and twenty healthy subjects (13 males, mean age 12.5 ± 5.2 years). All patients were on long-term blood transfusions since the age of 6 months to 1 year, and on an average, each patient required ~10–18 transfusions per year. Chelation therapy was prescribed as decided by the Genetics Department, according to individual serum ferritin values and included either deferiprone, 75 mg/kg/d or deferoxamine, 40 mg/kg twice weekly or both. Thirteen patients (43.33%) had been splenectomized. The baseline characteristics are summarized in [Table 1] and were comparable amongst the two groups. None of the patients had hypertension, diabetes, or dyslipidemia. The mean hemoglobin was lower and serum ferritin levels significantly higher in patients than in the controls. All patients had serum ferritin level >1200 μg/L. All included patients were asymptomatic and in New York Heart Association (NYHA) functional Class I. 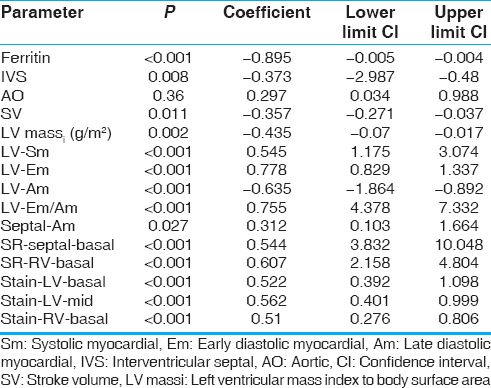 Conventional ECG parameters including LV dimensions, volumes, EF, fractional shortening (FS), E/A velocity, and MPI were not significantly different among the patients and controls [Table 2]. The LVEF (62.15 ± 7.96 vs. 59.94 ± 6.02, P = 0.27) was also similar in the two groups, and none of the patients had global LVEF <50%. 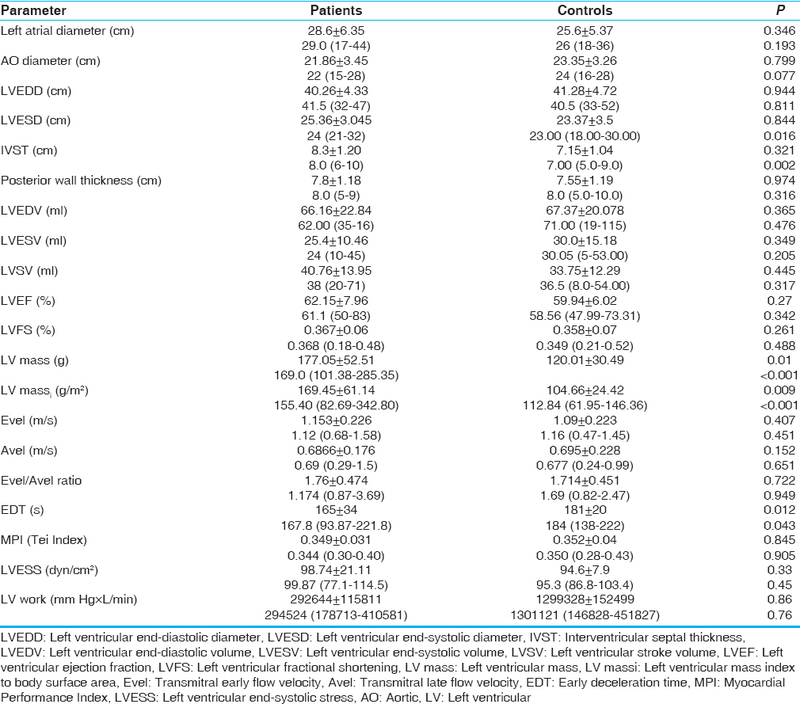 Patients with β-TM had higher LV mass and lower deceleration time of the mitral inflow velocity (EDT) as compared to controls [Table 2]. The Sm and Em/Am velocities at the basal segments of the septal LV wall (septal-Sm, septal-Em, septal-Am) and their ratio septal-Em/Am although slightly lower in patients, were not statistically different among the two groups. In contrast, velocities at the basal segments of the lateral LV wall revealed significant differences in patients and controls. Although the Sm velocity at the basal portion of lateral LV wall (LV-Sm) was similar to that in controls, the early diastolic myocardial velocity (LV-Em) and the ratio of Em/Am velocity at the basal segment of lateral LV (LV-Em/Am) were significantly lower in patients. Values of LV strain at the basal and mid segment of the lateral LV wall (S-LV-Basal and S-LV-Mid) as well as at the basal and mid septum (S-septal-basal and S-septal-mid) were significantly lower in the patients as compared to controls. Although the strain parameters of the basal RV were also depressed in patients with β-TM (S-RV-Basal), the strain at mid RV (S-RV-Mid) was not different in comparison to controls. SRI values at the basal and mid segment of the lateral LV wall (SR-LV-Basal, SR-LV-Mid) and at the basal and mid septum (SR-septal-basal, SR-septal-mid) were all significantly lower in patients. The corresponding values of SRI at the RV basal and mid-RV segments though lesser in patients, the trend was not statistically significant. The CIMT was similar between the patients and healthy controls (0.366 ± 0.134 vs. 0.357 ± 0.112, P = 0.3). On the other hand, vascular endothelium-dependant FMD was significantly impaired compared with controls (7.57 ± 3.16 vs. 18.08 ± 1.9, P = 0.018) while endothelium-independent nitrate-mediated dilatation (NMD) was not significantly different amongst the two groups (16.6 ± 2.1 vs. 17.4 ± 3.2, P = 0.56). The percentage of patients with FMD <5.5% in patients versus controls was 33% (10/30) versus 0% (0/20, P = 0.004). Serum ferritin levels had a significant positive correlation with LV massi (r = 0.536, P ≤ 0.001) and LV Am (0.663, P ≤ 0.001) while a negative correlation was noted with DT (r = −0.313, P = 0.027), LV-Sm (r = −0.651, P ≤ 0.001), LV-Em/Am (r = −0.83, P ≤ 0.001), S-LV-Basal (r = −0.566, P ≤ 0.001), S-LV-Mid (r = −0.692, P ≤ 0.001), S-septal-basal (r = −0.795, P ≤ 0.001), SR-septal-basal (r = −0.648, P ≤ 0.001), SR-septal-mid (r = −0.43, P = 0.002), and SR-RV-Basal (r = −0.601, P ≤ 0.001). A strong negative correlation was also seen between ferritin levels and FMD (r = −0.895, P ≤ 0.001) (all P< 0.004). LV Massi showed a significant positive correlation with septal Em (r = 0.397, P< 0.03), SR-septal-mid (r = 0.37, P = 0.004), and SR-RV-Mid (r = 0.46, P = 0.001). On univariate analysis, significant predictors of FMD included serum ferritin (odds ratio [OR] −0.004 [confidence interval (CI) −0.005–−0.004, P ≤ 0.001]), LV massi (OR − 0.44 [CI − 0.070–−0.017, P = 0.002]), LV-Sm (OR 2.125 [CI 1.175–3.074, P ≤ 0.001]), LV-Em (OR 1.083 [CI 0.829–1.337, P ≤ 0.001]), LV-Am (OR − 1.378 [CI − 1.864–−0.892, P ≤ 0.001]), LV-Em/Am (OR 5.855 [CI 4.378–7.332, P ≤ 0.001]), septal-Am (OR 0.884 [CI − 0.103–−1.664, P ≤ 0.001]), S-LV-Basal (OR 0.745 (CI 0.392–1.098, P ≤ 0.001]), S-LV-Mid (OR 0.700 [CI 0.401–0.999, P ≤ 0.001]), S-RV-Basal (OR 0.541 [CI 0.276–0.806, P ≤ 0.001]), SR-septal-basal (OR 6.94 [CI 3.83–10.05, P ≤ 0.001]), and SR-RV-Basal (OR 3.481 [CI 2.158–4.804, P ≤ 0.001]) (all P< 0.004). On multivariate linear regression analysis, only serum ferritin (adjusted OR = −0.004, P ≤ 0.001) and SR-septal-mid (adjusted OR = 4.506, P = 0.003) were observed to be significant independent predictors of FMD (both P< 0.004). In this study of thirty children with β-TM all of whom were in NYHA Class I, ECG analysis revealed that patients had significantly higher LV mass as compared to controls, although resting heart rate and Sm/diastolic BP were similar to controls. Increased LV mass in patients with β-TM is postulated to be due to chronic myocardial parenchymal iron overload. The observed absolute and indexed LV mass (177.05 ± 52.51 g and 169.45 ± 61.14 g/m 2 respectively) in our study is consistent with previous reports of increased LV mass in patients with β-TM (absolute/indexed LV mass 80.92 ± 39.49/86.14 ± 25.47, respectively, 228.0 ± 94.0/139.0 ± 42.0, 113.8 ± 38.0/ 82.4 ± 17.5 gm/m 2). Patients had significantly higher LV mass and although conventional parameters of Sm and diastolic function like LV dimensions, volumes, EF, FS, transmitral E and A velocity and their ratio were not altered significantly in patients, E/E' ratio at the lateral annulus was significantly higher as compared to controls representing subtle impairment of diastolic function. This was also accompanied by slight shortening of EDT in patients with β-TM. Previous reports have also documented that global LV diastolic function might be well preserved till late in the course of the disease. We found that β-TM patients had significantly lower Em velocity as well as lower Em/Am velocity ratio at the lateral LV as compared to controls. The septal velocity profile although slightly lower than controls was not significantly different. Comparison of TVI parameters in patients with β-TM revealed that Sm lateral wall velocity (LV-Sm, 8.76 ± 1.10) was significantly lower than Sm septal velocity (septal Sm, 10.84 ± 1.09), lateral Am velocity (LV-Am, 12.85 ± 1.84) was higher than septal Am velocity (septal-Am, 8.38 ± 1.96) and ratio Em/Am was lower in the lateral LV (0.811 ± 0.192) as compared to the septal LV (1.47 ± 0.421). Hence, despite an overall normal LVEF, there was a differential abnormality of TVI in the lateral versus the septal LV regions in patients with β-TM. We found that LV strain at the basal and mid segments of the lateral LV wall as well as at the basal and mid septum were significantly lower in β-TM patients. Strain rate was also impaired in patients with β-TM. The SRI values at the basal and mid segment of the lateral LV wall and at the basal and mid septum were significantly lower in patients. Regional impairment as detected by TDI and SI reflects the often patchy and nonhomogeneous deposition of iron within cardiac myocytes rather than the interstitium. Our observations further suggest that SI is not only more superior to conventional ECG parameters such as LVEF and LVFS, but also better than tissue Doppler parameters (TVI) in the detection of regional myocardial function. Although none of our patients had abnormal LVEF/FS or overt heart failure, analysis of TVI detected velocity parameters only at the lateral LV wall, while septal parameters were not different from controls. In contrast, SI and SRI detected lower Sm strain and strain rate both at the septal as well as the lateral across both the basal and mid segments. We found that basal RV strain was also depressed in patients while strain at mid-RV was not different in comparison to controls. Although SRI at the RV basal and mid-RV segments was lesser in patients, the trend was not statistically significant. Hence, there may be a differential regional involvement of the two ventricles in patients with β-TM with more pronounced changes in lateral and septal LV as compared to the RV. Although serum ferritin levels correlated with LV massi and strain parameters, this does not automatically establish a cause-effect relationship. Correlation analysis of LV mass and strain parameters revealed further mechanistic insights. It is possible that higher serum ferritin levels in patients with β-TM, translate into higher LV mass and eccentric hypertrophy. This in turn causes abnormal tissue deformation with abnormalities in strain and SRI parameters. Although we did not observe any differences in CIMT in patients versus controls, FMD was significantly more impaired in patients with β-TM. No differences in NMD were noted in the two groups. Altered vascular stiffness in patients with β-TM may be due to increase oxidative stress, endothelial dysfunction with disruption and fragmentation of vascular elastic lamellae, vascular calcification, and cell apoptosis.,, While CIMT and arterial stiffness both indicate vascular function, endothelial dysfunction, and arterial stiffening may be affected earlier on in the course of vascular involvement in β-TM. Hence, CIMT measurement may be normal and therefore not reflect early vascular changes which may be better detected by FMD assessment. Timely initiation and up-titration (if and when needed) of chelation therapy before the myocardial iron deposition leads to irreversible damage is important in these patients. Effective chelation of the labile iron molecules can help establish a negative iron balance and may help in improving survival if started early enough. Parameters such as TVI, strain, and strain rate are sensitive makers of early impairment of myocardial function, despite overall normal LV-Sm function. Although it is postulated that these abnormalities are secondary to myocardial iron deposition, this has not been validated in the current study. Early detection of subclinical regional myocardial dysfunction by deformation analysis including strain and strain rate may help in individualized tailoring of chelation therapy in patients with β-TM and should be the focus of future studies. In developing countries like ours where the burden of thalassemia is large, and ECG is an inexpensive and readily available modality, our study adds to the existent literature confirming its use to detect subtle myocardial dysfunction in patients with β-TM. A small number of patients (n = 30) represents an obvious limitation, and more studies with larger number of patients are needed to help further define the role of these newer ECG parameters in assessment of LV function in patients with β-TM. A single point ECG analysis is also an important limitation; serial longitudinal studies with measurement of parameters in follow-up are necessary to clarify if these abnormalities are reversible. Since there was a significant difference in LV mass among the two groups, LA volumes may have been significantly different in patients and controls. The fact that only LA diameters have been obtained represents a limitation of the study. The fact that T2* MRI imaging for in vivo assessment of myocardial iron concentration was not performed also represents an important limitation since how far do changes in ECG deformation parameters correlate with myocardial iron content is uncertain. Although we have measured serum ferritin levels, it is important to realize that this is not the gold standard to reflect the extent of cardiac iron overload and with increasing myocardial siderosis the correlation of ferritin with cardiac T2* values becomes even more unreliable. Strain and strain rate parameters are sensitive to loading conditions and whether the abnormalities in β-TM are secondary to altered loading conditions or increased myocardial iron stores needs to be further characterized. Since global cardiac Sm and diastolic function often remain normal until late stages in patients with β-TM, novel imaging techniques are necessary to detect early myocardial involvement. Our study demonstrates the ability of SI and SRI to quantify regional myocardial function in asymptomatic β-TM patients with preserved global Sm and diastolic function. Lewis BS, Rachmilewitz EA, Amitai N, Halon DA, Gotsman MS. Left ventricular function in beta-thalassemia and the effect of multiple transfusions. Am Heart J 1978;96:636-45. Kremastinos DT, Tsiapras DP, Tsetsos GA, Rentoukas EI, Vretou HP, Toutouzas PK. Left ventricular diastolic Doppler characteristics in beta-thalassemia major. Circulation 1993;88:1127-35. Kremastinos DT, Tiniakos G, Theodorakis GN, Katritsis DG, Toutouzas PK. Myocarditis in beta-thalassemia major. A cause of heart failure. Circulation 1995;91:66-71. Bosi G, Crepaz R, Gamberini MR, Fortini M, Scarcia S, Bonsante E, et al. Left ventricular remodelling, and systolic and diastolic function in young adults with beta-thalassemia major: A Doppler echocardiographic assessment and correlation with hematological data. Heart 2003;89:762e6. Kremastinos DT, Flevari P, Spyropoulou M, Vrettou H, Tsiapras D, Stavropoulos-Giokas CG. Association of heart failure in homozygous beta-thalassemia with the major histocompatibility complex. Circulation 1999;100:2074-8. Nesbitt GC, Mankad S. Strain and strain rate imaging in cardiomyopathy. Echocardiography 2009;26:337-44. Nesbitt GC, Mankad S, Oh JK. Strain imaging in echocardiography: Methods and clinical applications. Int J Cardiovasc Imaging 2009;25 Suppl 1:9-22. Voigt JU, Lindenmeier G, Werner D, Flachskampf FA, Nixdorff U, Hatle L, et al. Strain rate imaging for the assessment of preload-dependent changes in regional left ventricular diastolic longitudinal function. J Am Soc Echocardiogr 2002;15:13-9. Magrí D, Sciomer S, Fedele F, Gualdi G, Casciani E, Pugliese P, et al. Early impairment of myocardial function in young patients with beta-thalassemia major. Eur J Haematol 2008;80:515-22. Bay A, Baspinar O, Leblebisatan G, Yalçin AS, Irdem A. Detection of left ventricular regional function in asymptomatic children with beta-thalassemia major by longitudinal strain and strain rate imaging. Turk J Haematol 2013;30:283-9. Hamdy AM. Use of strain and tissue velocity imaging for early detection of regional myocardial dysfunction in patients with beta thalassemia. Eur J Echocardiogr 2007;8:102-9. Bilge AK, Altinkaya E, Ozben B, Pekun F, Adalet K, Yavuz S. Early detection of left ventricular dysfunction with strain imaging in thalassemia patients. Clin Cardiol 2010;33:E29-34. Cusmà Piccione M, Piraino B, Zito C, Khandheria BK, Di Bella G, De Gregorio C, et al. Early identification of cardiovascular involvement in patients with ß-thalassemia major. Am J Cardiol 2013;112:1246-51. Lang RM, Bierig M, Devereux RB, Flachskampf FA, Foster E, Pellikka PA, et al. Recommendations for chamber quantification: A report from the American Society of Echocardiography's Guidelines and Standards Committee and the Chamber Quantification Writing Group, developed in conjunction with the European Association of Echocardiography, a branch of the European Society of Cardiology. J Am Soc Echocardiogr 2005;18:1440-63. Reichek N, Wilson J, St. John Sutton M, Plappert TA, Goldberg S, Hirshfeld JW. Noninvasive determination of left ventricular end-systolic stress: Validation of the method and initial application. Circulation 1982;65:99-108. Knaapen P, Germans T, Knuuti J, Paulus WJ, Dijkmans PA, Allaart CP, et al. Myocardial energetics and efficiency: Current status of the noninvasive approach. Circulation 2007;115:918-27. Kelly RP, Ting CT, Yang TM, Liu CP, Maughan WL, Chang MS, et al. Effective arterial elastance as index of arterial vascular load in humans. Circulation 1992;86:513-21. Tei C, Ling LH, Hodge DO, Bailey KR, Oh JK, Rodeheffer RJ, et al. New index of combined systolic and diastolic myocardial performance: A simple and reproducible measure of cardiac function – A study in normals and dilated cardiomyopathy. J Cardiol 1995;26:357-66. Celermajer DS, Sorensen KE, Gooch VM, Spiegelhalter DJ, Miller OI, Sullivan ID, et al. Non-invasive detection of endothelial dysfunction in children and adults at risk of atherosclerosis. Lancet 1992;340:1111-5. Kremastinos DT, Rentoukas E, Mavrogeni S, Kyriakides ZS, Politis C, Toutouzas P. Left ventricular filling pattern in beta-thalassaemia major – A Doppler echocardiographic study. Eur Heart J 1993;14:351-7. Fitchett DH, Coltart DJ, Littler WA, Leyland MJ, Trueman T, Gozzard DI, et al. Cardiac involvement in secondary haemochromatosis: A catheter biopsy study and analysis of myocardium. Cardiovasc Res 1980;14:719-24. Cheung YF, Chan GC, Ha SY. Arterial stiffness and endothelial function in patients with beta-thalassemia major. Circulation 2002;106:2561-6. Tsomi K, Karagiorga-Lagana M, Fragodimitri C, Karabatsos F, Katsiki V. Arterial elastorrhexis: Manifestation of a generalized elastic tissue disorder in beta-thalassaemia major. Eur J Haematol 1999;63:287-94. Aessopos A, Samarkos M, Voskaridou E, Papaioannou D, Tsironi M, Kavouklis E, et al. Arterial calcifications in beta-thalassemia. Angiology 1998;49:137-43.